The FORESEE project (Future Proofing Strategies for Resilient Transport Networks against Extreme Events) has officially begun with a Kick Off Meeting that taking place in Bizkaia, Spain. 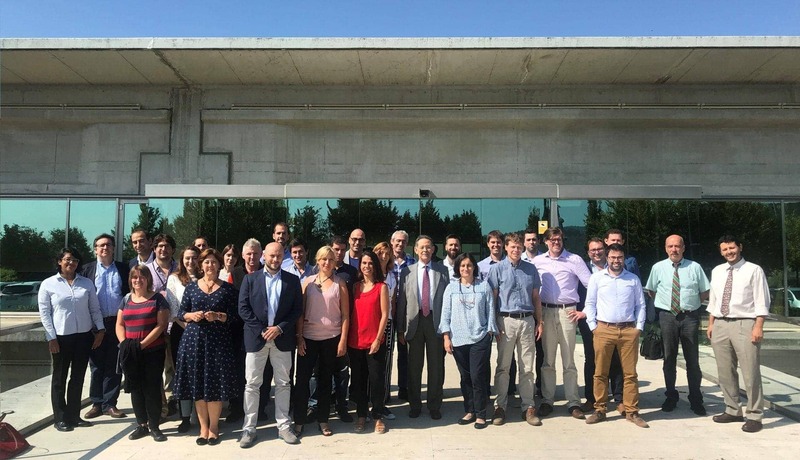 The project is a European funded project within the R&D framework Horizon 2020 by the European Commission, with the participation of the Railway and Transportation Managing Direction and the R&D Department of Ferrovial Agroman. The overall objective of FORESEE is to develop and demonstrate a reliable and easily implementable toolkit for providing short and long term resilience schemes against traffic disruption due to flooding, landslide and structural damage for rail and road corridors and multimodal terminals. This toolkit should enable its user to anticipate, adapt, recover, and minimize disruption against extreme weather events and man-made hazards. This project has a duration of 42 months that will cover not only the development of the toolkit but also its validation in six case studies including highways, bridges, railway lines, and metro lines and stations exposed to earthquakes, extreme snow, floods, traffic jams, accidents and other extreme events. The nature of this project covers the whole lifecycle of infrastructures, from decision and policy making, funding, design, construction and operation and maintenance so we are confident the obtained result will be useful for all business units within the Ferrovial Group as an end-to-end infrastructure provider. Novel materials and systems that will position Ferrovial Agroman in an advantaged position within the state of the art of technologies such as: permeable asphalt pavements, new slope stabilization-protection systems, sustainable drainage systems and innovative engineering of links/interconnections. New criteria for the optimization of pavement layer thicknesses, for the use of ballast or slab track, as well as other decision making support systems for design and construction of infrastructure related with their durability and lifecycle costs. Boost innovation within the industry by involving authorities and infrastructure managers like Infraestruturas De Portugal or associations such as the European Union Road Federation, partners of the consortium.